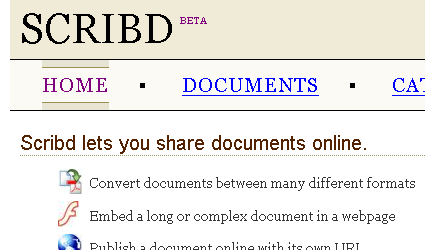 Scribd lets you share and discover documents online. There are all sorts of features that make it easy and fun to publish, convert, embed, read, and do many other things with documents. After playing with the site, I have to say they’ve taken a very simple idea and executed it well. They employ a very clean and simple web design and keep the core value (publishing content) front and center. The site navigation is incredibly simple and effective (all text links, practically no use of embedded images). The only embedding that goes on is the actual content–the works that are published–using Macromedia FlashPaper 2. In a nutshell, I’d describe Scribd as a web-based service for republishing your content using FlashPaper and sharing it with an online community (other Scribd users), as well as being able to embed the Scribd-hosted version in your own pages. Trip and Jared have already addressed a lot of must-do features: easy licensing of content using Creative Commons licenses, categorization within their taxonomy, user ratings, comments on content, content view tracking statistics. They also link off to Print(fu) to offer printing of the content, which could allow Scribd users to self-publish works in e-book (or, in this case, FlashPaper) format then allow consumers to request printed copies at their own expense. It’s a great entry into the custom publishing space–if they can monetize on this, it could be big, especially if they can “pay through” the commissions from Print(fu) back to the original content publisher. In other words: if I publish my manuscript at Scribd and someone prints it at Print(fu), I should get paid a percentage of the take, since it was my content. Also, if Scribd allowed me to upload “private” content and allowed me to opt to put it behind a paywall, that could open up another business: e-book distribution. I could then sell my manuscripts as e-books through Scribd, too. Scribd is already handling the user authentication–if they add the payment processing and authorization, they could do this. Someone, invest in, buy or hire these guys–quick! They’re bright, they’ve got a great idea and they’ve executed it really well! I can’t wait to see where they take this idea, but the possibilities are wide open. rec.arts.erotica + Scribd’s text-to-speech = profit! I would like to fool around with their site but how private is the beta? Quite private I suspect as all I get is the index page that tells me something about the site but no burther functionality. Julio: Did you leave your email address (at the bottom of that index page)? If you do, when they’re ready to add more users I’m sure they’ll let you know.